16 November 2008, Great Meadows NWR, Concord, MA – photo by David Sibley. Taken with the 10x zoom on a Canon digital camera. The Canada on the right was a bit farther to the right in the original photo, I cut and pasted it closer for better comparison. It was distinctly smaller than the Canadas around it, with a very short neck and short bill. In flight going away it appeared no more than 2/3 the bulk of the Canadas next to it. Whenever I scan Canada Goose flocks in the east looking for Cackling Goose, there are always a few birds that grab my attention because they look small. Often they are marginally smaller than the other Canadas, sometimes their smallness was an illusion (happened to be standing in a furrow, next to an unusually large goose, etc). After a closer study these “small” birds fit nicely into the normal range of variation of the local Canadas, and the impression of smallness vanishes. This bird stood out because its smallness held up to closer scrutiny; it was truly small with very short neck and short bill. 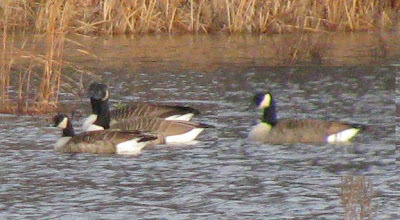 I called it a Canada rather than Cackling because it seemed just a little too long-billed, too large overall, and the head/bill too wedge-shaped for ‘Richardson’s’ Cackling Goose. It also looked the same color as the Canadas around it, without the gray sheen on the back or golden cast on the breast that many ‘Richardson’s’ show. There are very few reports of ‘Lesser’ Canada Goose in the northeast. This could be due to the difficulty and inherent uncertainty of identification: we identify only the most clear-cut examples and report those tentatively, if at all. Or maybe it’s because few birders really look for them or follow-up on possibles since “it’s just a Canada Goose”. Or maybe they are truly rare. I have actually seen more ‘Richardson’s’ Cackling Geese in the northeast than convincing ‘Lesser’ Canadas; but that could be due to any of the reasons above. Given the normal distribution of this subspecies – breeding farther south and west than ‘Richardson’s’ Cackling, with shorter migration – I would expect it to be less frequent than ‘Richardson’s’ on the Atlantic coast, at least in the north. The only way to figure that out is to keep watching for, and documenting, these small geese, in order to develop a better sense of the identification and status of the various subspecies. « How many rare birds did we miss before the internet? My husband sees what he called a “blonde” Canada goose in the lake at Eldrige Park in Elmira NY. I told him I would research it and found your page. We don’t have the new phones so no pictures just his description. I might go there with my point and shoot to see for myself. 1/25/18 today I saw in a local pond three size Canada geese a larger more traditional goose the cackling goose with his little short stubby bill and very small body size and then several inbetween middle-sized ones. Maybe a lesser? The head seem to be more rounder then the Canada the bills looked like the Canada and not the cackling. There were 36 geese in the pond and they had moved together when I pulled up in the car so I got to see all three of the different sizes close together. When birdwatching today, I saw a flock of smaller Canada Geese mixed with a flock of larger Canada Geese (probably B. c. maxima). They looked the exact same as their larger counterparts, except that they had a shorter neck and what seemed to be a slightly stouter, steeper, forehead. However, they had the same body colouration and pretty much the same body size. Would this be the Richardson’s Cackling goose or the Lesser Canada goose? Hi Melinda, Assuming you are in the northeast? The smaller birds you are seeing are probably northern breeders, subspecies interior and/or canadensis. These can be almost as small as hutchinsii, and they do hybridize, which makes identification challenging. Flocks are more reliably identified than individuals. Many Cackling Geese are obviously small and show different colors than Canada. If you find a confusing smallish individual, look at the birds associating with it. If you don’t see any typical Cackling Geese among them then all are probably Canadas. Based on the latest info, true Lesser Canada Goose parvipes is probably restricted to breeding in Alaska and far northwestern Canada, wintering in the west, and might never occur in the eastern states.